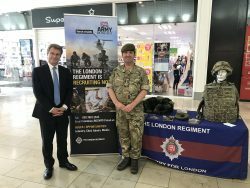 Wandsworth-based reservists paid a visit to the Southside Shopping Centre to chat to staff and local people as part of national Reserves Day (Wednesday). Reservists give up their spare time to serve in the Reserve Forces, balancing their civilian life with a military career. The Reserves offer a variety of unique opportunities working with other services, as well as travel and challenging training overseas and they often operate in specialist areas such as medical and cyber. Reserves Day is an opportunity to recognise their contribution and local reservists were invited to Southside by the centre’s management following an approach from Wandsworth Council. 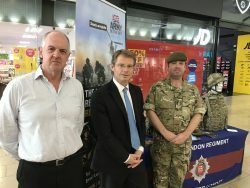 Cllr Jonathan Cook, Deputy Leader of Wandsworth Council and Paul McCue, Managing Director of Enable Leisure and Culture and the council’s Armed Forces Advisor, visited the display presented by Colour Sergeant Gareth Evans of the London Regiment. The London Regiment is the only Army Reserve Regiment in the Guards Division and provides infantry soldiers to reinforce the five regiments of Foot Guards on operations. More than 500 London Regiment soldiers have deployed to Northern Ireland, the Falklands, Bosnia, Macedonia, Kosovo, Croatia, Iraq and Afghanistan and United Nations Tour to Cyprus. It is the only Army Reserve Infantry Regiment based in London and recruits from the Greater London area. Its Headquarters (Anzio) Company is based in the Reserve Army Centre at St. John’s Hill, Battersea and its C (City of London Fusiliers) Company operates from Balham. Cllr Cook said: “At a time when the Reserve Forces are playing an increasingly-important role, the Council is strongly committed to supporting , especially, those units whose home is in our borough. The men and women of the Reserves face the challenge of combining military service with civilian life and deserve much credit and recognition for doing so”. Wandsworth is also home to the Royal Marines (City of London) Reserve based in Southfields and hosts army, sea, marines and air cadet units.